Representing Asia Pacific's largest international Internet conference, Asia Pacific Regional Internet Confer-ence on Operational Technologies (APRICOT) draws many of the world's best Internet engineers, opera-tors, researchers, service providers, users and policy communities from over 50 countries to teach, present, and do their own human networking. 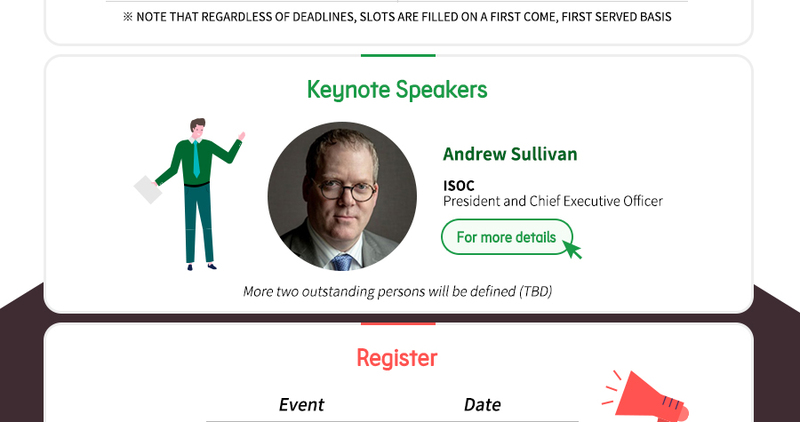 The ten-day summit consists of seminars, workshops, tutorials, con-ference sessions, birds-of-a-feather (BOFs), and other forums with the goal of spreading and sharing the knowledge required to operate the Internet within the Asia Pacific region. Especially this APRICOT 2019 will be held at Daejeon Convention Center (DCC) in Korea from February 18 to 28 with KISTI. 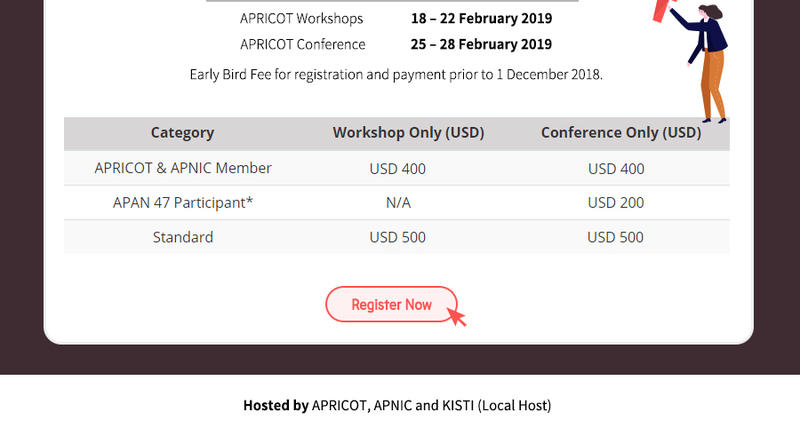 APRICOT is a valuable opportunity for participants and sponsors to hear and contribute to discussions concerning current and developing Internet networking technologies and trends. 행사 논문 제출에 관한 내용으로, Call for Papers Opens, Draft Program Published, Final Deadline for Submissions, Final Program Published, Final Slides Received 의 내용을 확인하실 수 있습니다. Register: 행사와 일정에 관한 표가 하단 이미지에 있습니다. 행사 일정에 관한 내용으로, Event의 APRICOT Workshops의 Date내용과, APRICOT Conference의 Date내용을 확인하실 수 있습니다. Early Bird Fee for registration and payment prior to 1 December 2018. 행사 사전등록비에 관한 내용으로, Category의 Workshop Only(USD) 의 내용과, Conference Only(USD) 의 내용을 확인하실 수 있습니다. "사전등록기간이 1월 31일까지로 연장되었으니 많은 등록을 부탁 드리겠습니다."